Many Catholics might remember Saint Blaise's feast day because of the Blessing of the Throats that took place on this day. Two candles are blessed, held slightly open, and pressed against the throat as the blessing is said. Saint Blaise's protection of those with throat troubles apparently comes from a legend that a boy was brought to him who had a fishbone stuck in his throat. 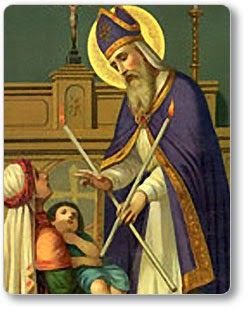 The boy was about to die when Saint Blaise healed him. Take time as Saint Blaise did to find out how you can help wild animals. Find out what is being done to support and protect the wildlife in your area. There is wildlife everywhere, even in cities. Even a birdfeeder can help God's creatures survive.